D.C. weekly update: While FIU made historic commitments in Washington D.C. to expand college access, an FIU alumna introduced Vice President Biden at a White House college summit, and FIU hosted national transportation leaders in Miami. On Dec. 4, FIU Provost and Executive Vice President Kenneth G. Furton, and FIU alumna Idaykis Rodriguez, who works as a postdoctoral fellow at FIU’s STEM Transformation Institute, joined President Barack Obama, First Lady Michelle Obama, and Vice President Joe Biden – along with many college presidents and other higher education leaders – to announce new actions to help more students prepare for and graduate from college. 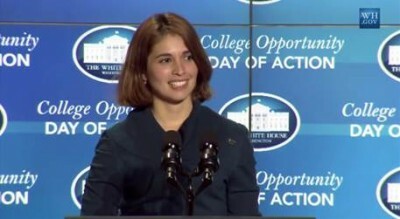 Rodriguez was tapped to introduce Vice President Biden at the White House’s College Opportunity Summit. On average, less than two Hispanic women earn a Ph.D. in physics a year. FIU also announced its commitment to three initiatives, which are in line with the Obama Administration’s priorities: building networks of colleges around promoting completion; creating kindergarten to college (K-16) partnerships around college readiness by investing in high school counselors as part of the first lady’s Reach Higher initiative; and increasing the number of college graduates in the fields of science, technology, engineering, and mathematics (STEM). College Opportunity: Florida Consortium of Metropolitan Research Universities (FIU, University of Central Florida and University of South Florida). The consortium will aim to increase the six-year graduation from 54 percent in 2012-2013 to 71 percent in 2020 and 76 percent by 2025. Overall, this will produce an additional 5,642 graduates by 2020 and a total of 7,742 graduates by 2025. K-16 Partnerships: FIU and the Miami-Dade Public School’s Education Effect at Booker T. Washington. Leveraging a strong collaborative platform, and private support of more than $1 million, this commitment aims to increase college-going and success by increasing dual enrollment courses; transforming teacher professional development in STEM; implementing math and civics after school institutes; infusing college entrance test preparation and reinvigorating the engineering academy, while reopening an on-site planetarium. The White House College Opportunity Day of Action is part of the president’s commitment to partner with colleges and universities, business leaders, and nonprofits to support students across the country. The goal is for the United States to lead the world in college attainment and instruction and all students will experience evidence-based instruction in at least one course in three years. This is projected to reduce individual course failure rates by at least 20 percent within 2 years of implementation. This event is the second College Opportunity Day of Action, and will include a progress report on the commitments made at the first day of action held earlier his year in January. FIU President Mark B. Rosenberg participated in that event. Also this week, FIU’s Accelerated Bridge Construction University Transportation Center (FIU ABC-UTC) addressed the building and delivering of economical and long-lasting bridges at the 2014 National Accelerated Bridge Construction Conference in Miami Dec. 3-5. Federal Highway Administration Acting Administrator Gregory Nadeau delivered the keynote speech. Since 2009, Nadeau has focused on spearheading the development and administration of Every Day Counts (EDC), the FHWA’s signature initiative that addresses shortening project delivery time and accelerates the rapid deployment of innovative technology using a state-based model. He serves on the U.S. Department of Transportation’s Freight Policy Council, and prior to joining FHWA, Nadeau served as the Maine Department of Transportation’s (MaineDOT) deputy commissioner for policy, planning and communications. For more on FIU’s role in D.C., stay connected with FIU in D.C. on Facebook and Twitter.